I have grown weary of the 30 Day Comic Book Challenge because I don't much care for the remaining requirements. Save for one: Day 27 - Favourite Comic Book Movie. But, I'm not actually going to post my favourite comic book movie. I'm going to take this opportunity to explain, once and for all, why I like X-Men 3: The Last Stand. Yeah you heard me. I liked it! It wasn't until some time after seeing this film that I came to appreciate Scott Summers. Prior to that, I strongly disliked him and considered him one of the worst and most annoying characters. If youngified Patrick Stewart and Sir Ian showed up at my door, I would be a very happy girl. I thought Kelsey Grammer did a fantastic job embodying the Beast as both scholar and brawler. And he said it. He said it! I read the Ultimate X-Men that had some convoluted plot involving the Phoenix entity .. something to do with a prison that was earth and aliens and lalalala. We already have one convoluted Phoenix Saga, thanks, and it was told in a far more comprehensive manner. Now, considering what I said above about having to condense and alter things to suit a medium that does not have time for large backstories, I think this movie did an excellent job of explaining the Phoenix. The explanation, to me, complimented what I have always felt about Jean: There was a spark - an intensity in her that Wolverine saw and that the Phoenix entity was drawn to, but Jean was never truly permitted to tap into by her writers, who always bound her to Scott, Logan and the Professor. Unfortunately, the movie bound her to Magneto, but at least she got to unleash that which the Professor (who is not the fluffy bunny he makes himself out to be!) had forced down, rather than help her cope with it. When you lock away that kind of power for that long, well of course she's gonna be pissed. As part of my Scott hate, I defaulted to wanting Jean to be with Logan because I felt that Jean always stuck with Scott because he was safe and kept her safe from that dark part of her soul. Logan saw that spark and would have helped her face it. Unfortunately, due to Professor X's suppression, the potential therapy sessions probably would have been too little too late. 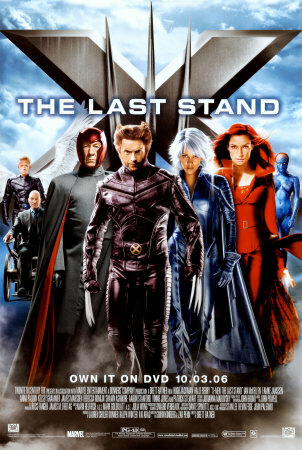 I liked X-Men 3 because it recognized that and had Logan recognize it. Scott couldn't kill Jean in the comics (okay okay so Logan failed, too) and so she had to do it herself, but here, Logan was the man and did it at her request because they both knew it was the only way. It was a tragic love story and I loved it. Sue me! u hate on halle berry alot. on paper she was the perfect storm. on screen not so much but not THAT bad. When she first got the role, she basically made some comment about how this was the kind of crap role a Black woman gets pigeon-holed in to. Then she proceeded to pout her way through the movie and not bother to act at all. Had she taken the time to read the source material, she'd know just how incredible Storm is. Once she realized this was a money maker, then she decided to play along. If they'd given the role to someone who wasn't so high on herself and the roles she "deserved" then we'd have gotten someone who actually respected the character. Halle Berry was only good as Storm on paper because she is Black.